Paragraphs represent the basic building blocks of the arguments made in academic essays. This article looks at two essential elements of paragraphs, offers a general method for constructing paragraphs, drafts a general template for paragraph structure, and looks at some common paragraph pitfalls. In an academic essay, the purpose of a paragraph is to support a single claim or idea that helps establish the overall argument or purpose of the paper. Paragraphs should be focused around this single idea or point, and they should be clearly related to what comes before them. One of the best ways to ensure that a paragraph is focused and clearly related to the thesis statement is to ensure that it has a good topic sentence. 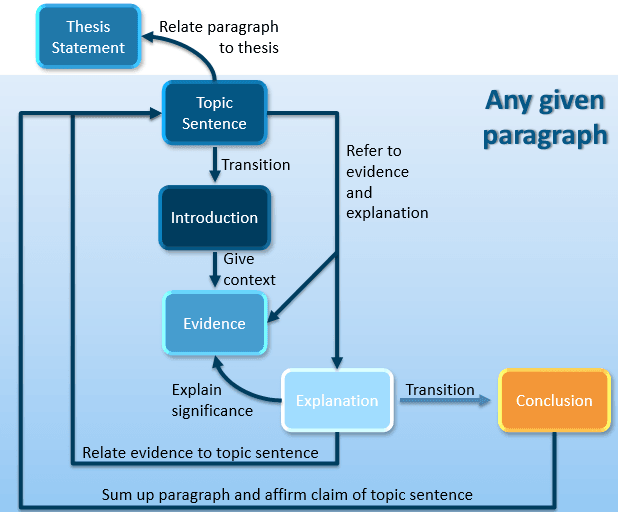 Each sentence in a paragraph should help support the topic sentence of that paragraph (in the same way that each paragraph should relate to the thesis statement), so each sentence should connect with the main point of the paragraph in some way. Sentences should also connect well with each other, and in forging sentence-to-sentence connections, good transitions are crucial. Beyond of these two key features of good paragraphs (good topic sentences and transitions), there is a certain method of presenting information in a paragraph, and there are things to avoid in paragraphs. Following the topic sentence, a paragraph should introduce, provide, and explain its evidence. After this, it should either repeat, with new topic-sentence-related evidence, or take a sentence or two to close the paragraph. While good topic sentences offer an idea of what the paragraph is going to be about and how that fits into the rest of the paper, at the heart of a paragraph are evidence and explanation that support the key claim of the paragraph. We can call these the heart of a paragraph both in the sense that they give purpose to the paragraph and in the sense that they appear (roughly) in the middle of the paragraph. It’s useful to think of a paragraph’s structure by comparison to the structure of an essay. As the body of an essay needs a good introduction, so do the evidence and explanation given in a paragraph. Usually, this evidence will need to be contextualized, prefaced, or otherwise introduced before it is provided. To provide evidence is usually to state a fact that supports your paragraph’s claim, given in the topic sentence. After providing any evidence, you will have to explain how that evidence supports the paragraph’s claim. Paragraphs on any subject require that the primary evidence for any claim be clearly explained to support that claim, so don’t assume that your facts speak for themselves. In a sociology paper, this might mean explaining the significance of a statistic; in literary studies, the most interesting element of a quotation from a poem or story; in history of technology, what the technical explanation of a process means in simple terms; and in philosophy, the assumptions and logical connections at work in an argument. Different fields deal with such explanation in different ways, but they all require it. Finally, a paragraph requires a satisfying conclusion. To evaluate whether you’ve done a good job wrapping up your paragraph, ask yourself whether the final sentence or two sufficiently conveys the thrust of the paragraph. If not, consider adding a summary sentence. This template presents a very simple paragraph structure. It is highly adaptable and can be used throughout an essay, although there are certainly other ways of forming good paragraphs. Sentence (or more) that introduces or contextualizes evidence. Sentence (or more) that provides evidence in support of the topic sentence. Sentence (or more) that explains how the evidence just given relates to the topic sentence. Sentence (or more) that eitherintroduces new topic sentence-related evidence (go back to step 2) or closes the paragraph. (1) George Orwell’s 1946 essay “Politics and the English Language” has had an enduring impact on thought about the relationship between politics and language. (2) This impact is particularly obvious in light of the various critical review articles that have recently referenced the essay. (3) For example, consider Mark Falcoff’s 2009 article in The National Review Online, “The Perversion of Language; or, Orwell Revisited,” in which he analyzes several common words (“activist,” “civil-rights leader,” “diversity,” and more). (4) Falcoff’s close analysis of the ambiguity built into political language intentionally mirrors Orwell’s own point-by-point analysis of the political language of his day. (5) Even 63 years after its publication, Orwell’s essay is emulated by contemporary thinkers. This paragraph could be altered or expanded (and improved) in several ways, but the course of the paragraph would always need to maintain the general form of (1) through (5). Even if we added or removed some of the particular sentences, these basic functions would need to be fulfilled. Notice that on the above template the minimum length of a paragraph is five sentences. This can be slightly condensed, since we can, for example, introduce and provide evidence in the same sentence. We can only condense so much, though—normally you won’t be able to cover all of the basic functions of a paragraph in under three sentences. Short paragraphs (three sentences or so) are rare, and should be used only when special emphasis is needed or the point of the paragraph is very simple. One- or two-sentence paragraphs are almost unheard of and should be generally avoided. Size is a good indicator of whether a paragraph is too long. Generally speaking, with double-spaced, 12 point, standard font, and standard margins, a paragraph should not go much over 3/4s of a page. The reason a paragraph runs too long is only loosely related to size, though—rather, it’s a matter of how many topic or points are covered in a paragraph. Remember, each paragraph should be about just one thing, and each paragraph should be just long enough to fully explain or prove its point. Where there is a significant shift in topic matter, even while making one larger argument, a paragraph should often be split into two distinct paragraphs. Where there is a significant shift in argument, even while the topic remains the same, a paragraph should often be split into two distinct paragraphs. A paragraph is unfocused or “too listy” when it mentions many things but does not cover most (or, perhaps, any) of them in enough detail. If you find a paragraph with this problem, you can (1) eliminate some points to focus on just a few, (2) break the paragraph into more robust sub-paragraphs by giving more attention to each point, or (3) work on tightening the connections between each of these points and their collective relation to the topic sentence or thesis. Note that all of these strategies require additional information, either to explain connections or to deepen the discussion (or both).